Pay your deposit as a one-time payment, then take advantage of the optional payment scheduling tool. Set up regular recurring payments to help you manage your funding. Any donations made to your trip will be automatically deducted from your balance, and will reduce your recurring payments evenly. 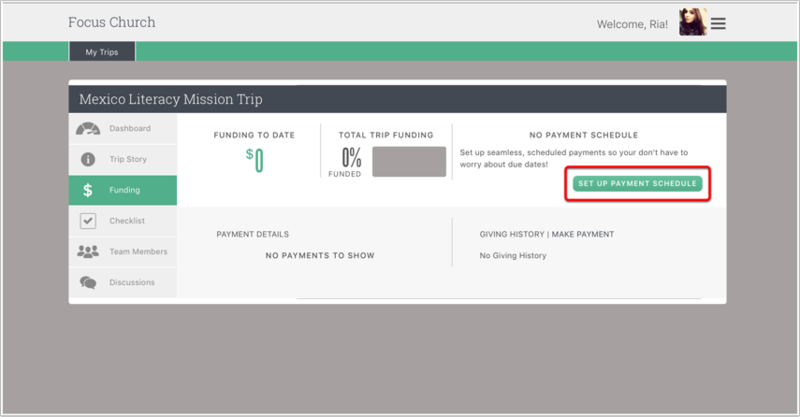 Find the trip you wish to manage, and choose the Funding option on the left of the screen. To pay your deposit (or to make a standalone payment at any time), select Make Payment. You may elect to pay the entire remaining balance, or specify another amount. 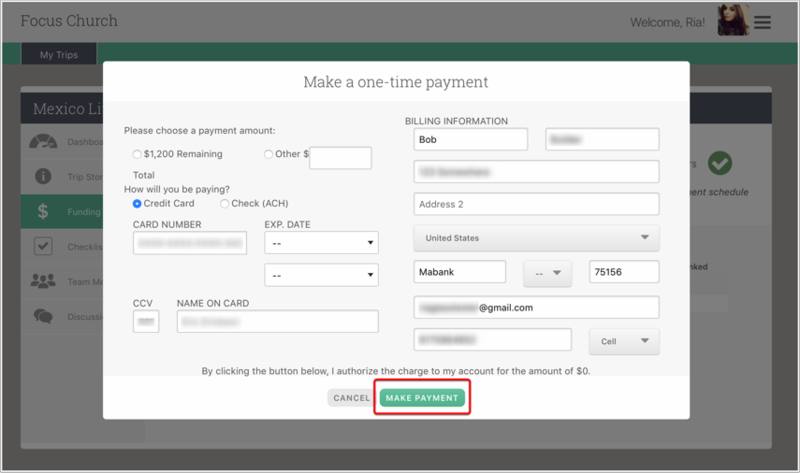 Choose your preferred payment type, and enter your billing information. When you are finished, click the Make Payment button to complete the transaction. *Please note that due to the payment processor-recommended 7 day allowance for an eCheck to clear, we will be waiting 7 days to decide within Missions if the eCheck was processed successfully or not. If you are making an ACH/eCHeck payment, please allow 7 days for the payment to clear Missions and to post to your ChMS. 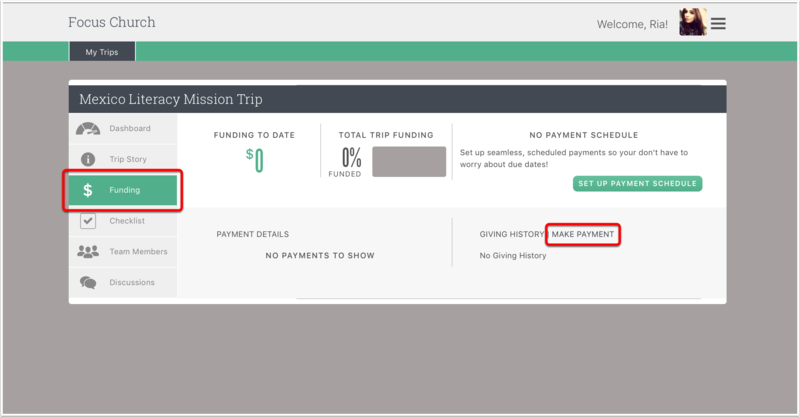 To set up a payment schedule for your account, click the Set Up Payment Schedule button on your main Funding screen. Within the Setup a Payment Schedule window, you may choose how you prefer to break out your payments in the time remaining for the trip. Choose the number of payments and/or the day of the month you want the transaction to post, and Missions will calculate the even payment amounts for you. Donations made towards your balance will be evenly deducted from your scheduled payments. Once you are satisfied with your schedule, enter your preferred payment method and your billing information. 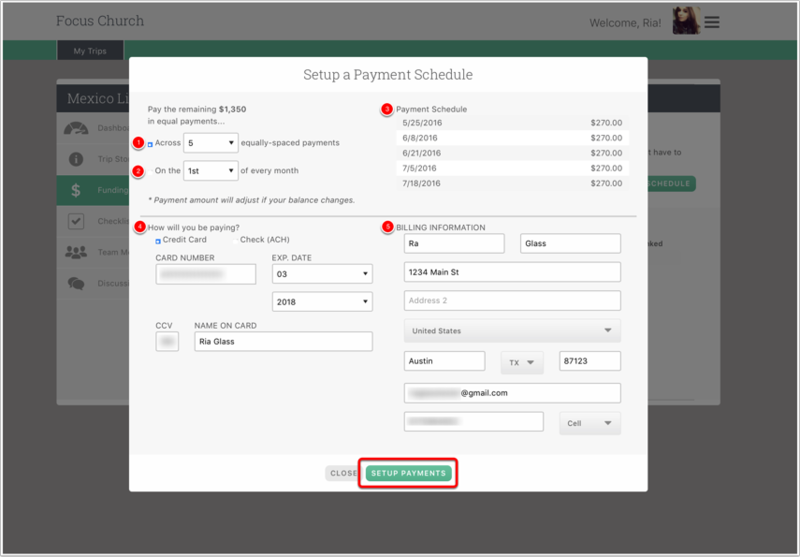 When you're finished, click the Setup Payments button to save your schedule. 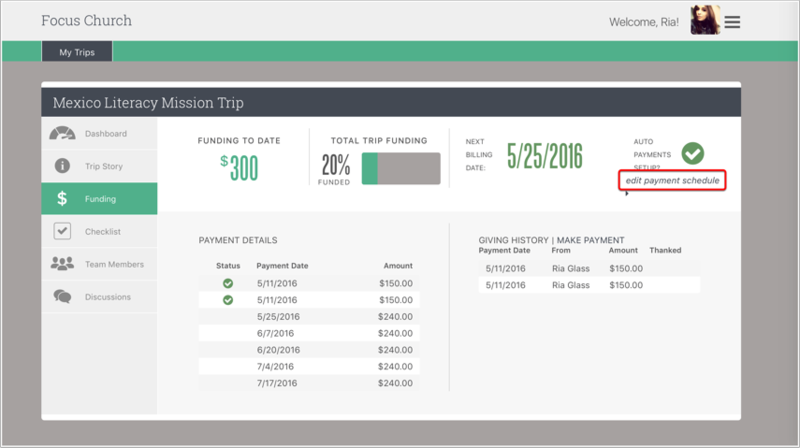 Should you need to make changes to your schedule (or cancel it altogether), select edit payment schedule from your trip's Funding page. 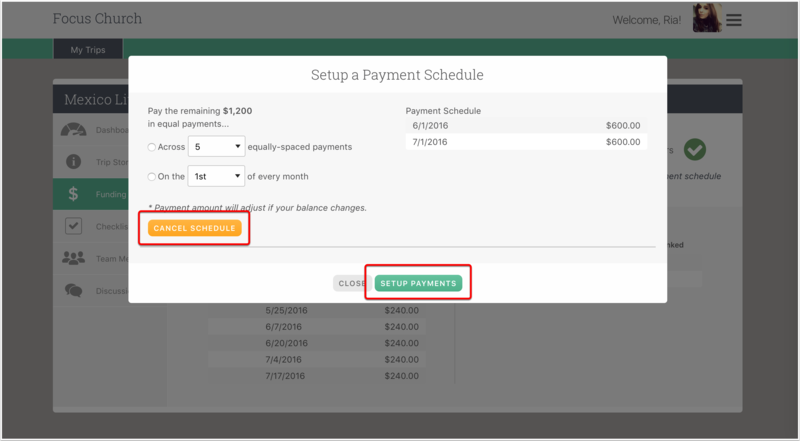 From the Setup a Payment Schedule window, make any needed changes, and click the Setup Payments button to save your new schedule. To cancel your schedule completely, click the Cancel Schedule button. You will still be able to make single payments, and can set up a new schedule if you choose to later.